We demonstrate a simple and facile way to improve the efficiency and moisture stability of perovskite solar cells using commercially available hole transport materials, 2,2′,7,7′-tetrakis-(N,N-di-4-methoxyphenylamino)-9,9′-spirobifluorene (spiro-OMeTAD) and poly(3-hexylthiophene) (P3HT). The hole transport layer (HTL) composed of mixed spiro-OMeTAD and P3HT exhibited favorable vertical phase separation. 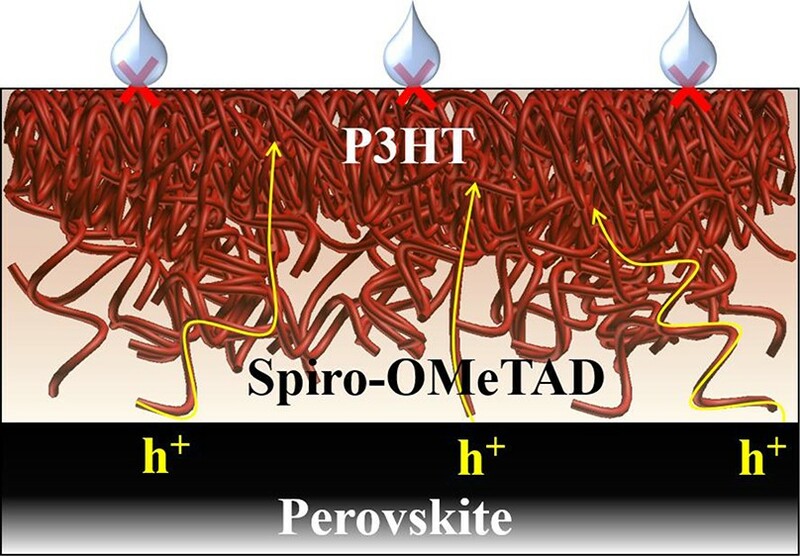 The hydrophobic P3HT was more distributed near the surface (the air atmosphere), whereas the hydrophilic spiro-OMeTAD was more distributed near the perovskite layer. This vertical separation resulted in improved moisture stability by effectively blocking moisture in air. In addition, the optimized composition of spiro-OMeTAD and P3HT improved the efficiency of the solar cells by enabling fast intramolecular charge transport. In addition, a suitable energy level alignment facilitated charge transfer. A device fabricated using the mixed HTL exhibited enhanced performance, demonstrating 18.9% power conversion efficiency and improved moisture stability.